From Thursday 11th to Sunday 14th August 2005 he was present with his young aspiring band of players; now from Wednesday 16th to Sunday 20th August 2017 he will be present again with his latest cohort of fledglings. Nils Sandberg, just as he was present for the inaugural edition; he will guide members of the Ångby Club at the forthcoming El Salvador Junior and Cadet Open, the 13th consecutive staging of the tournament. In 2005 with Gustaf Ericson on duty, the archetypal blonde haired Viking warrior with head band to create an even more fearsome character, in partnership with the more composed looking Martin Singh, the duo finished in runners up spot in the Junior Boys’ team event. They were beaten by three matches to two in the final by Brazil’s Efraim Carvalho and Ricardo Kojima. The same fate befell the Ångby Club girls; Madeleine Melcher and Felicia Falk experienced defeat by the same margin when facing Brazil’s Mariany Nonaka and Karin Sako. Silver medals but later in the tournament there was gold; Madeleine Melcher won the Junior Girls’ Singles event, she beat Mariany Nonaka in the final. Neither Madeleine Melcher nor Mariany Nonaka progressed to the highest levels but I guarantee they will always remember the table tennis tournaments, the travels; it enriched their education, one that no classroom can present. Somewhat conversely, the winner of the Junior Boys’ Singles did progress to a very high level and continues to play at a very high level; the winner was Portugal’s Marcos Freitas. He beat Efraim Carvalho in the final. Now, in 2017, nine boys from the Ångby Club will be on duty in El Salvador, the mantle of the responsibility very much falling on the hands of Oskar Danielsson. He is the highest rated male player on duty. 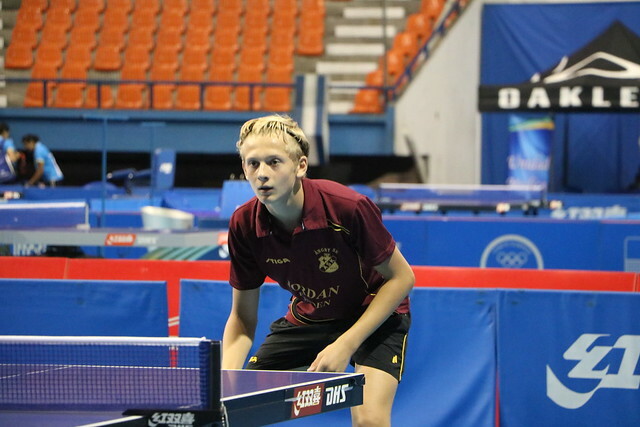 Furthermore, he has enjoyed success on the ITTF World Junior Circuit; in 2015 he won the Cadet Boys’ Singles title at the Jordan Junior and Cadet Open in Amman. He beat the host nation’s Khaled Khader in the final. Now for the task for the 17 year old is to make his mark at junior level. Earlier this year he was in action in his native Sweden at the Safirs International. Also he competed in Paraguay and Jordan; whilst he proved competitive, he has yet to reach the latter stages of a Junior Boys’ Singles event. In San Salvador, the capital of El Salvador, a chance beckons; also there is an opportunity for revenge. Last year, he successfully negotiated the group stage but then lost to Panama’s Jacobo Vahnish. Successful at the recent Latin American Junior and Cadet Championships, Jacobo Vahnish is also on duty in El Salvador; one place behind India’s Mudit Dani, he is third highest listed on duty.